Is there any possible way this could be a more of an embarrassment for the Academy of Motion Picture Arts and Sciences? Its members nominated five directors for their Best Director trophy but Ben Affleck wasn't deemed worthy of inclusion. 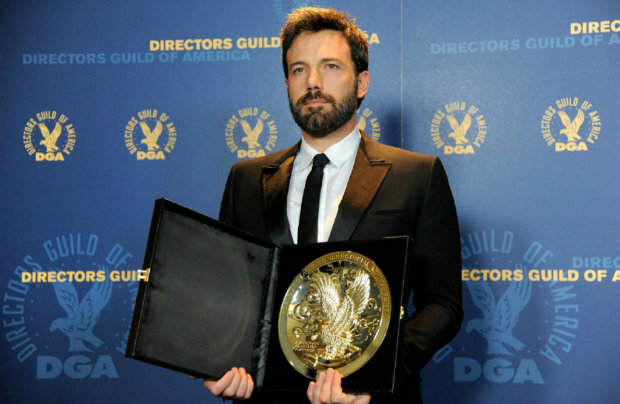 That's odd because Hollywood's guild comprised solely of folks who make movies - and TV shows - not only found Affleck worthy of inclusion, they found him worthy of winning. The 40-year-old strolled off with the Directors Guild of America's top prize Saturday night, as Argo's sweep train steamrolled on. Argo has not lost this awards season, bagging the big trophy at every awards show leading up to the Oscars (Critics' Choice, Golden Globes, Producers Guild, SAG, et al.). What makes Saturday night's win an especially damning situation for the Academy? The prestige that goes along with the DGA title: Since 1948, the winner has pocketed Oscar's Best Director all but six times – let's make that seven. Whomever wins best director February 24th will have to live with the fact that it's accompanied by a rather substantial asterisk. A riotously embarrassing one.